As me and my family are vegetarian, this place was a real treat. The menu was good and they was very kind and helpful staff. Would recommend the veg burger. Good for family. 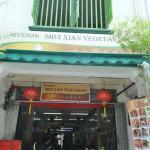 This restaurant is located in a central part of Melaka and offers a variety of vegetarian dishes. Most of their menu is the same each day, but they also have daily specials of two dishes which change depending on the day of the week. 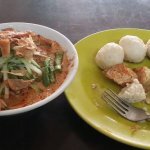 We had the Mee rebus (4 ringgit) and the Chee cheong fun (3 ringgit). The chee cheong fun is a cold noodle dish which was ok. It’s not a huge dish, but for 3 rm it was decent value. 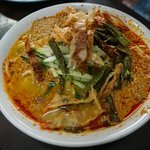 The mee rebus is a more substantial dish and we enjoyed that one more. The flavour of the broth was excellent and it was served piping hot. This is an excellent choice when in Melaka. It’s great value and both vegetarians and non-vegetarians would appreciate the tastiness of the food. 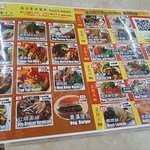 This place is cheap, delicious and friendly. I still dream of the incredible mee rubus that I had for breakfast which was perfect to soothe my heavy head. 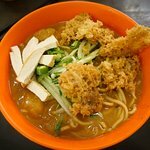 We also had the laksa and the chicken rice which was also tasty. So many great veggie options. Very nice and affordable vegetarian restaurant. 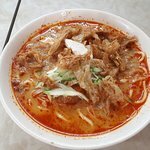 I came both days of my stay I Melaka for lunch. 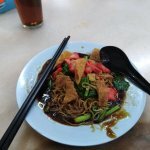 I almost regretted I couldn’t stay longer in Melaka just to try more of their dishes. 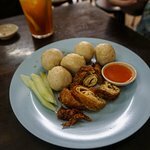 I was surprised that a simple dish like chicken rice balls can be that delicious. The owner speaks very good English, is very friendly and helpful. I absolutely recommend! 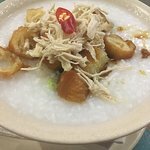 Been to Shui Xian Su Shi Yuan Vegetarian Food? Share your experiences!